I have seen some great tutorials for DIY piñatas, but this has to be the easiest one I have seen. Kelly transformed cardboard heart boxes into these adorable mini conversation heart piñatas, which are a fun party favor for Valentine's Day. They would be really cute for a bridal shower or engagement party too. And they are just the right size to hide a number of little treats inside. 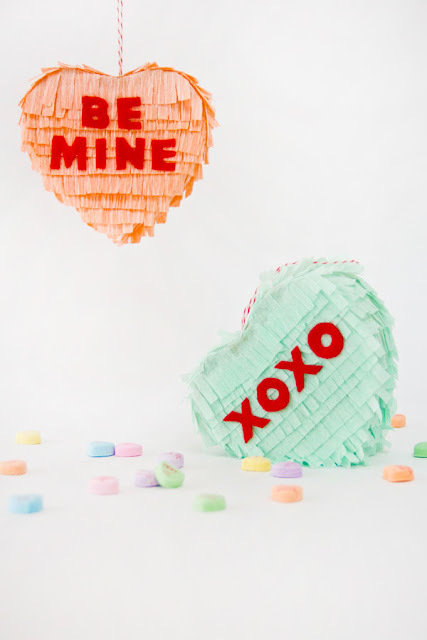 You can find out how to make these DIY conversation heart piñatas over at Studio DIY.